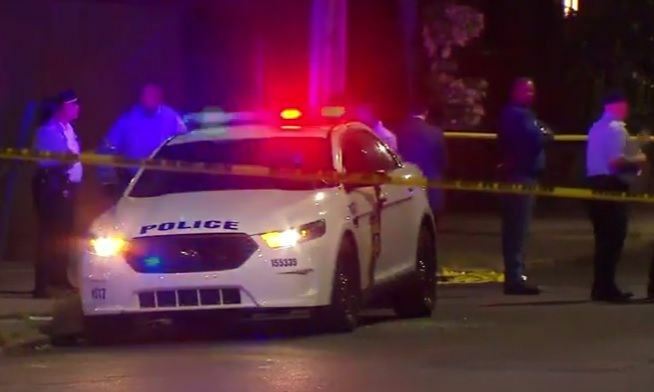 Two police officers and four others were shot in West Philadelphia Friday night. The suspect was carrying a rambling note that spewed hatred for cops. The gunman in a shooting that left one woman dead and five others injured, including two police officers, was carrying a “rambling” note that spewed hatred for law enforcement, police said in the hours after the late Friday shooting. Ross said around 11:20 p.m. a man walked up to Sgt. Sylvia Young’s police cruiser on 52nd and Sansom streets and opened fire on the officer. “Help me, please!” Young yelled on police radio moments after she was shot numerous times inside her police cruiser. Other officers in the area heard the shots and responded, chasing the lone gunman, Ross said. As the suspect fled, he shot five more people, including a University of Pennsylvania police officer. A man and a woman outside a nearby bar and a man and a woman sitting in a car at 49th and Sansom were also shot. The woman in the car died early Saturday morning and the man remains in critical condition. Young, a 19-year veteran, was shot eight times, striking her arm and protective vest. Ross said Young, who works in the 22nd District, is in stable condition. …Ross said a letter was found at the scene and police believe it was written by the suspect. The letter, according to Ross, contained ramblings about hatred for police officers and named a specific parole officer as a target. Here’s the full police dispatch scanner audio of the shootings last night.